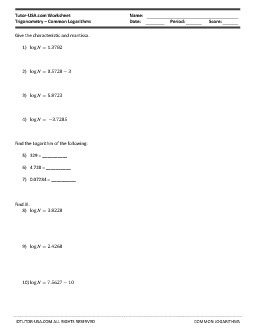 This free trigonometry worksheet contains problems on common logarithms. The worksheet begins with problems where students must find the mantissa and characteristic of logarithms. The remaining problems require use of the properties of common logs to solve. Give the characteristic and mantissa.